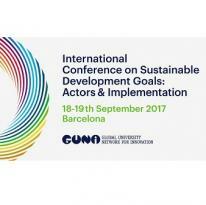 On September 18-19, the Polytechnic University of Catalonia hosted the International Conference on SDGs organized by the Global University Network for Innovation (GUNi). IAU Secretary General, Dr. Hilligje van't Land, was one of the speaker. Some 150 participants shared knowledge, ideas, experiences and expectations around the challenges involved with the SDGs. Dr. Hilligje van’t Land, IAU Secretary General, shared insights from the 2016 IAU survey on Higher Education and Research for Sustainable Development during the workshop «SDGs and the Role of Higher Education Institutions». She presented specific sustainability initiatives from IAU Members worldwide.